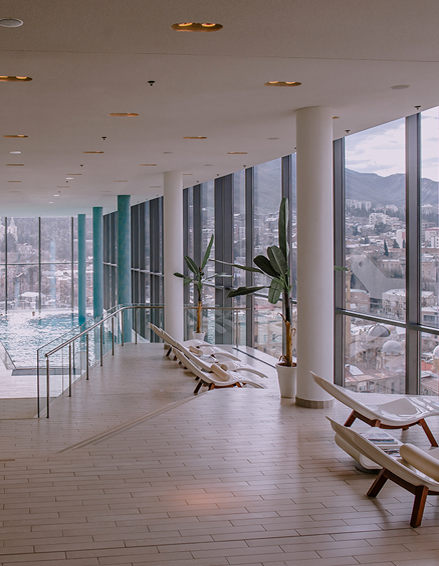 Traversing Radisson Blu Iveria Hotel’s top two floors, Anne Semonin Spa overlooks Tbilisi in its sun-drenched brilliance. With its massive floor-to-ceiling windows, light pastel tones and aerial views, this 1,600-square-meter spa offers nourishment for all human senses. Equipped by infinity lounge pool, relaxation area, thermal suites, KLAFS© solariums, 9 treatment rooms, fitness centre and an outdoor pool, Anne Semonin Spa offers everything and more. 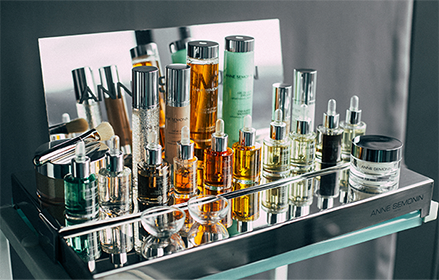 Deluxe treatment collection presents an ingenious blend of aromatic essentials oils, trace elements and marine ingredients with the classic French touch and a holistic approach to treating the individual needs of your body and skin. 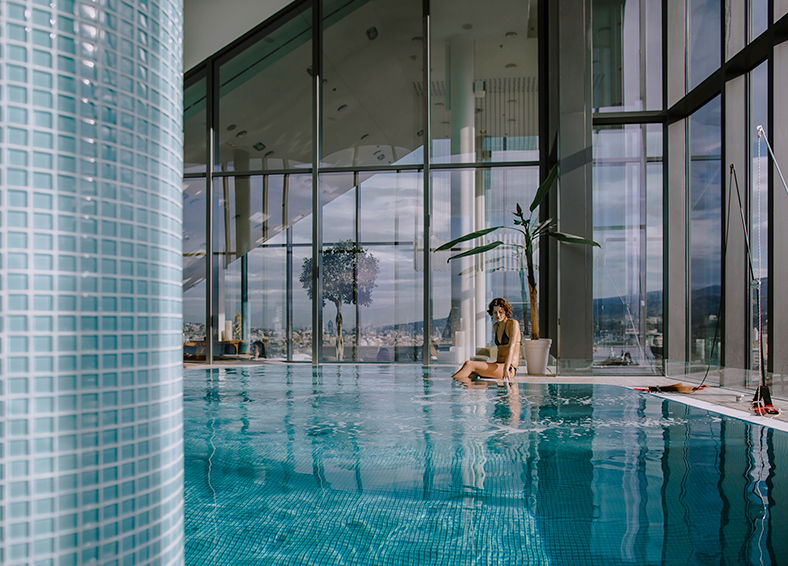 Anne Semonin Spa, Tbilisi, is staffed by professional therapists and fitness instructors eager to turn each guest encounter into an invigorating experience. With the perfect blend of trace elements, essential oils and ingredients from nature, Anne Semonin spa products will leave your skin glowing and your body revitalized. Choose from our Platinum, Gold and Silver membership plans. A truly indulgent experience to stimulate the senses and bring about a deep sense of tranquillity! Commencing with an invigorating Sea Salt exfoliation and followed by our Anne Semonin Ocean Oil thalassotherapy bath containing Blue Chamomile and Marine Criste, whilst accompanied by our Active Ice eye brightening massage. The experience is then concluded with warmed aromatic oil and thermal stone massage with special attention to the abdominals, back, neck and shoulders to aid a sense of deep relaxation and restore mind and body balance. This ultimate exfoliating experience with Black Sand from Tahiti and aromatic oils actively sweeps away dead surface skin cells, leaving skin wonderfully soft, silky, detoxified and youthfully radiant. The delicate fragrance of exotic verbena promotes a holistic sense of wellbeing and relaxation. The body is then softly manipulated using a variety of advanced massage and movement techniques prescribed for your specific needs and developed to bring about a deep sense of restoration. Re-awaken your senses! A remodelling and firming treatment designed to care for the décolleté and bust contour. Gentle exfoliation and the benefits of active marine ingredients. Improves skin texture, suppleness and the appearance of fine lines visibly lifting and firming the skin. Experience the effects of youth and radiance with this wonderful anti-ageing facial and firming eye treatment. Your skin is quenched with the power of Evening Primrose Oil, Red Micro Algae and Wild Indigo. Experience the renowned effects of Anne Semonin’s ‘Express Radiance Ice Cubes’ - perfect to melt away fine lines, firm and refresh. The results, a more plumped, radiant and hydrated skin. Ideal for city skins or imbalanced, stressed skins suffering from breakouts or congestion. A complete deep cleansing facial is achieved through traditional steam. A detoxifying and rebalancing peel off mask is then applied using intensive complexes to give that deep clean feeling. A relaxing and deeply healing scalp treatment to soothe away stress and tension. The neck, shoulders and scalp are massaged with effective Indian Champi and Shiatsu techniques. Warm aromatic oils and nourishing cream mask treat the scalp and hair leaving you feeling revitalised. Encounter the ultimate bespoke facial incorporating a Client-specific intensive eye and décolleté treatment. Aromatic intensive complexes and serums will boost Cellular renewal whilst a firming algae mask will detoxify for absolute skin radiance. This treatment is a complete and effective remedy for removing the stresses of daily life leaving skin firm, smooth and brilliant. Ideal for combination, oily, congested, problematic skin, this complete deep cleansing purifying treatment combines traditional steam and extraction techniques with rebalancing lymphatic drainage massage. A detoxifying and anti-inflammatory peel off mask and aromatic intensive complexes are used to soothe calm and rebalance the skin to encourage a visibly clear complexion. Shiatsu is an old, traditional Japanese healing method. Shiatsu means ‘Finger Pressure’. The Shiatsu Practitioner uses palms, fingers, thumbs, knuckles, elbows and knees to work on the body’s acupuncture points to give you a sense of well-being. Reflexology is the practice of stimulating points on the feet in order to encourage a beneficial effect on some other parts of the body, or to try to improve general health. Practitioners believe the foot to be divided into a number of reflex zones corresponding to all zones of the energy of the body, and that applying pressure in the form of massage to “tight” or “gritty” areas of your foot will stimulate the corresponding part of the energy body and assist the self-healing process. During your 30 minute treatment, your therapist will work on your scalp, neck and shoulders. Based on the ancient Ayurveda Healing System. Chinese massage aimed at restoring the Yin and Yang Balance. The ultimate in pure indulgence. Two therapists work in synchronised harmony using stretching rolling and deep massage techniques to release the tension from your whole body leaving you feeling totally relaxed. This massage restores energy, tones up muscle tissues, boosts blood flow and restores the balance of the nervous system. An amazing experience. Perfect for couples. Let yourself be pampered completely, and experience this enveloping massage, which encourages total relaxation, as a two therapists harmoniously synchronize their movements to deliver the most sensual treatment imaginable. Not to be missed! A self-heating marine mineral mud treatment for the back, neck and shoulders is designed to release tension and combat tight muscles. The feet and lower legs are carefully massaged to improve circulation allowing a powerful sense of wellbeing. This energising, stimulating therapy will rebalance your energy levels and reactivate your senses. A relaxing, unwinding therapy for expectant mothers, targeting areas of aches and pains and rejuvenating the face and body to give ultimate radiance back to the skin. This nurturing therapy will help treat muscular aches, fluid retention, stress and fatigue. Become a member at Anne Semonin Spa and enjoy upgraded benefits.